I am pleased with service. Prompt to responding emails and service. Item as described. Good price. Fast delivery. Have bought from before. Smooth transaction, FAST delivery!!! A++++ THANKS! Excellent eBay seller! Thank you so much!!! Very fast shipping. We like it. Sensitive remote. I don't know a lot about electronics, but my husband does and he likes it. I like it because it's easy to use for someone who does not know much about electronics. I like that we can also control what my girls have access to. Also we use netflix a lot, and I like that the remote has a netflix button on it that will go directly to netflix. One thing is that the blu ray is a lot smaller than I pictured it in my head. The base of my TV is bigger than the blu ray player. I have a 32" TV. It's okay slightly annoying that I have to go through the whole key pad on the screen with the remote to type things. But that's pretty much always the case. The other thing about the remote is that it is so sensitive. I find myself having to focus pressing buttons otherwise when I want to pause it without being careful, it will pause for a second and then come on again. Also when I am trying to type on the screen more letters will come up even though I meant to only type one L two or three will come on the screen. Not a big deal. We are happy with the product! I have a real problem with Corporate Decision making attitude. Always shoving things down the throats of the public and in this case the presence of Apps that we can't use or don't even want to show on a machine we need control of for ourselves and our families. For example, youtube, here is an App that is out of control giving everybody, including children, access to inappropriate material all without any filters. I have unplugged this machine for this reason. the remote does not have code for an APEX brand TV; in fact it will only control the following TVs:SONY' Hitachi; LG/Goldstar/NEC, Toshiba, RCA, Mitsubishi/MGA,Pioneer,Sharp, Panasonic,Samsung, or Phillips. No way to know this until you are deep into the instructions. We were counting on the remote to control the volume and it would have been nice to turn off the TV with just the one remote also. Really disappointed about the remote. But if this feature isn't important to you it is a nice blu ray and streamer for venues like NETFLIX and such. Even has a NETFLIX button. Love that WIFI also. Great product, easy to use, I love it, features are amazing. Remote needed though, also, upgrading it causes it to not load some websites, but it's easy to program, and great picture. I love it! 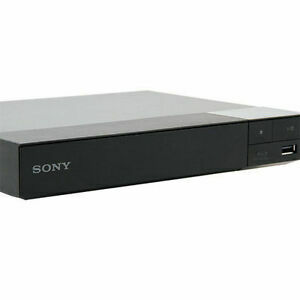 Perfect DVD Blu-Ray and internet service player! This machine works perfectly -- it's easy to use, full of features, and has a simple remote control. The price was perfect.